Last month we kicked off with the first monthly column by Gary Priest, the curator of animal care training at San Diego Zoo Global. Gary oversees the creation of our Animal Care Training Series, which started with the Fundamentals, and now we are busy constructing the Intermediate Series of Animal Care Training. The Advanced Series for Animal Care Training will then follow. These, combined with our webinars and Introduction to Animal Species courses, provide thorough training for animal care professionals. That said, we are always looking at new ways to enhance your training opportunities, operations, and our profession. As a pilot and sailor, a compass is a valuable resource for Gary, and we anticipate his column will prove to be a useful resource as you navigate the topic of training animal care professionals. In this monthly feature of the Academy Newsletter, I plan to offer supervisors, managers, curators, and directors insights, ideas, tools, and strategies that will help you achieve success with your staff and your professional development and training programs. If you are struggling with this, you are not alone. Staff training is a huge undertaking, and it is difficult for many reasons that we will explore in this and future columns. Imagine that you are planning a sailing voyage from Santa Barbara, across the Pacific Ocean to the Hawaiian Islands. A chart and compass are pretty important, because combined, they can tell you where you are relative to where you've come from, and where you are going. Where are you currently? Do you need to adjust your course to arrive at your destination? Why is it important to spend the energy necessary to take this journey? What tools will you need for the journey? What will it look like when you arrive? Regarding your current position, ask yourself if your staff is broadly experienced, with an average of 10+ years experience, or do they have 1 year of experience repeated 10 times? Is your facility a smaller one, perhaps with higher staff turnover? Is consistency among staff a problem? If any of these issues ring true for your situation, training is the answer. Be assured that this voyage is not an option, but a necessity. Before you undertake any trip, it is always wise to begin with a destination in mind. The destination may be different for each institution, and it depends on multiple variables. Winning consensus on the destination before you leave the dock is also wise. Be ready to describe the destination, and the importance for the journey, in some detail. Your fellow voyagers will have an interest in knowing. Our industry is heavily regulated. In addition, we work with potentially dangerous animals and have responsibility for ensuring public safety. Our organizations have significant liability. In 1991, at the San Diego Zoo Safari Park, an accident with an elephant resulted in the death of one of our keepers. In the United States, a workplace fatality automatically triggers an Occupational Safety & Health Administration (OSHA) investigation. The first question the federal inspectors asked our general curator was about our staff training program. They wanted to see the training records. AZA-accredited institutions are required to provide ongoing professional training to their animal care staff. If you don't currently have a record-keeping system for your staff training program, your voyage with the Academy is absolutely necessary. This voyage is taken, in part, online. The training is consistent and available 24/7, anywhere in the world. It is best that online training is also supplemented with a hands-on learning program, tailored to your individual facility and staff. Fostering a robust culture of open discussion is a best practice, and it may reveal ideas in addition to the material presented in an Academy course. Animal-related jobs in a zoo or aquarium are difficult to land. Today, most entry-level applicants hold at least an associate degree, or, more frequently, a bachelor's degree in a science-related area. Training in our profession really begins the moment the applicant becomes an employee. So, fostering a culture that supports ongoing training as a normal practice is an important destination in itself. By creating a staff development and advancement program, you are elevating our industry, and better equipping the people whose profession it is to make animal care and welfare their top priority. To be effective, training goals must be directly linked to employee performance evaluations and advancement. 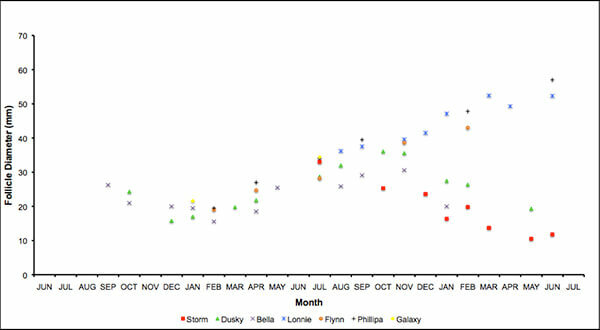 Next month, we will look at an actual chart in use by one accredited institution on their voyage. 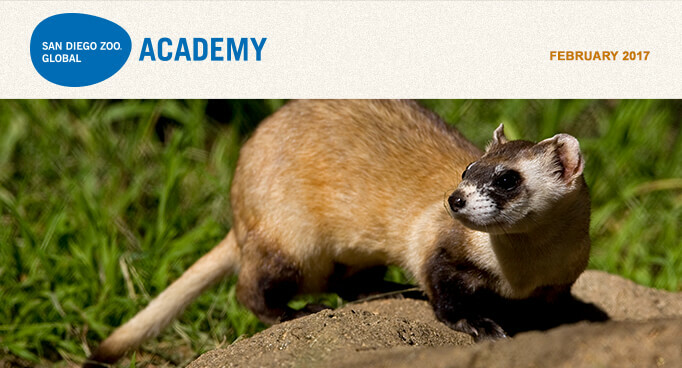 The San Diego Zoo Global Academy Puts the Alaska SeaLife Center in the Spotlight! 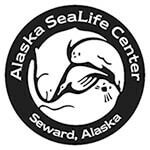 The Alaska SeaLife Center in Seward, Alaska is now part of the Academy's collaborative learning environment. Welcome! 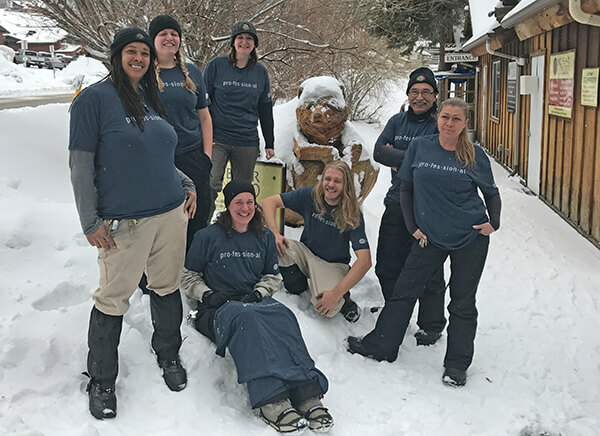 Animal Care staff at Big Bear Alpine Zoo are wearing their Academy T-shirts. Academy Shirts Available from Shopzoo! Whether a gift for yourself or someone else, or as an incentive for your institution's training program, please click here to find out how to order your own Academy T-shirts! Please join us for the Administrator's Users Group Webinar, hosted by Academy partner CypherWorx. The next webinar is Wednesday, February 15, at 11 a.m. PDT. After registering, you will receive a confirmation email containing information about joining the webinar. This course will define facts associated with lightning, describe ways lightning can kill, and illustrate how to protect yourself and co-workers against lightning hazards. In 2017, we are extending the book club program offered to employees at San Diego Zoo Global to Academy subscribers, via this monthly newsletter. Why a book club? It is beneficial for employees to strive for balance in their lives, and reading a good book can be a time for recovery and renewal. A new book will be chosen each quarter, and a different question about that book will be asked in the newsletter for three months. Then a new book will be selected for the next quarter. If you enjoy reading, join us for the Roar Longer Book Club! 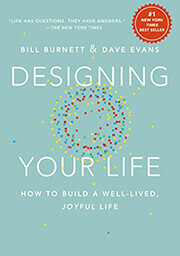 The first quarter 2017 Book Club selection is Designing Your Life: How to Build a Well-Lived, Joyful Life, by Bill Burnett and Dave Evans. We decided to start 2017 with an inspirational and helpful book on living life to its fullest! Did you perform all of the exercises in the book? Which ones did you find most thought-provoking? Zoological organizations have changed for the better over the years, and they continue to evolve. Some of these innovations emanate from one or more organizations, while others result from zoological community-wide shifts in policies or practices. Every zoological facility changes daily as animals, staff, and guests come and go. Physical changes in exhibits and fiscal changes in funding are among other apparent changes. Fortunately, zoological organizations have demonstrated the capacity to change, which is an important factor in the future sustainability of the zoological world as a force for good. The nature and limits of change within the zoological community also explain the most pressing challenges facing zoos, aquariums, and marine and wildlife parks today. Heightened public consciousness about animals, stemming from our relationships with those animals in our homes, families, and hearts, contributes to these challenges—and creates corresponding opportunities to do more good. Enhanced understanding about animals, ethical considerations worthy of civil engagement, and other criticisms are now, and perhaps forever, a staple of the operating environment for most every zoological organization. In short, culture and society, especially here in the US, has changed much faster and more profoundly than the zoological world. A chance encounter with these words from Jack Welch calls attention to the need for awareness: "[i]f the rate of change on the outside exceeds the rate of change on the inside, the end is near." While that might sound harsh, it corresponds to Darwin's take on survival. It also illuminates the path forward, which remains a consistent focus of this column. Simply acknowledging the challenges is a decent start, but more is needed to get unstuck. As James Allen wrote over a hundred years ago, "[p]eople are anxious to improve their circumstances, but are unwilling to improve themselves. They therefore remain bound." The exciting news is that once we understand the causes behind the effects and challenges before us, we can get to the work of fundamentally changing ourselves, our zoological organizations and community, and even the world, for the better. Perhaps the words of fellow columnists Dr. Rob Jones or Gary Priest, Academy courses, an inspiring book or lecture, or a humbling conversation or constructive criticism can help to discern the reinvention needed to clear the path ahead. Here is a short list of ideas for such reinvention. Change our thinking and language about our mission, animals, and each other, including our critics. Animal welfare or well-being is the overriding priority every day. Act in harmony with our highest ideals and our compassion for all life. Practice Excellence Beyond Compliance® and the Principles of Constructive Engagement (see Turning Challenges into Opportunities: the Principles of Constructive Engagement, November 2015, available here. Other ideas have been set out in prior columns or are forthcoming. There is a role for everyone in the zoological community to be a part of this change—caregivers, curators, fund-raisers, construction and maintenance teams, marketers, security, directors and board members, regulators, critics, visitors…. Deep thinking, spirited conversations, and hard work will move us ahead if we choose to seize the opportunities presented. Changing for the better. Changing for the animals. Changing for good. As mentioned in last December's newsletter, the grey nurse (or sand tiger) shark Carcharias taurus is an iconic shark that has been displayed in public aquariums since 1896, when it was first held in the New York aquarium. It practices intrauterine cannibalism, and after a pregnancy of approximately 12 months, two pups are born that are about 1 to 1.2 meters in length and very developed. It is survival of the fittest from day one. These sharks have traditionally bred poorly in aquariums for a variety of reasons, some of which we now understand and some which still remain unknown. When Dr. Jon Daly and I started researching elasmobranch reproduction in 2004, very little was known. 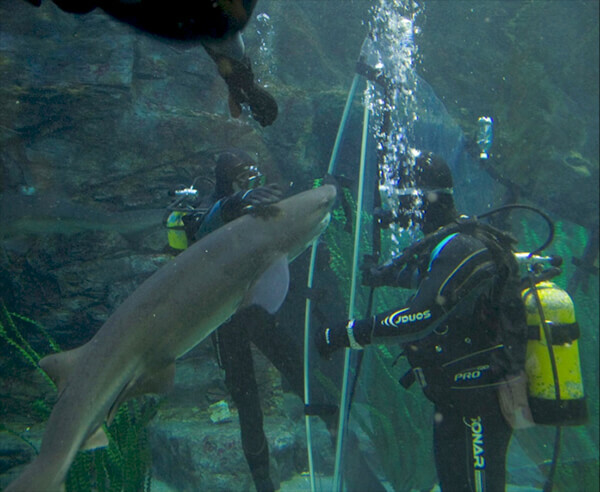 One of the first tasks was to develop a repeatable method of catching sharks; one that was safe for both the aquarists and the sharks. We chose the broadnose sevengill shark Notorynchus cepedianus as our surrogate species. This shark is a viviparous shark like the sand tiger, but does not have the intrauterine cannibalism, and has never been bred in captivity. A shark catch bag was developed from thick, clear plastic (the material used in soft-top car windows), and divers would go down and catch the shark that had been selected for examination that particular week (see photo below). Each shark was examined every six to eight weeks. Interestingly, the sharks did not seem to avoid the bag and the divers. We also carefully considered the welfare of the sharks during the capture and restraint process, and we developed a scoring system from which a paper was produced (Daly et al. 2007). For restraint, we used tonic immobility: with the top of the catch bag opened, and holding onto the shark, the animal is turned onto its back. After a brief struggle of 10 to 15 seconds, the shark goes into a catatonic state. Plenty of water with oxygen is then flowed over the mouth area to keep the gills irrigated. We always set a ceiling of 10 minutes for our examinations. With the females, we started looking at their ovaries using ultrasound, and following their egg development, often over a two-year period. The picture below shows two eggs that were maturing in one of our females ("Lonnie"). The graph details the egg sizes of seven of the female sharks over a two-year period. We would find and measure a minimum of 10 eggs at each examination. The study ran for five years, and so all of these results were not actually in the same years, but were combined into this one graph. In some of the females, the eggs enlarged to over five centimeters until they ovulated. In other females, the eggs underwent a process of atresia and regressed. What triggered the different responses, we still do not know. We have since undertaken studies on several species of sharks and rays, but I will always have a soft spot for the sevengills, as they were the first we worked with in the early years. Next month, we will talk about working with the male sharks, and the future of this research. Reference: Daly J, Gunn I, Kirby N, Jones R and Galloway D (2007). 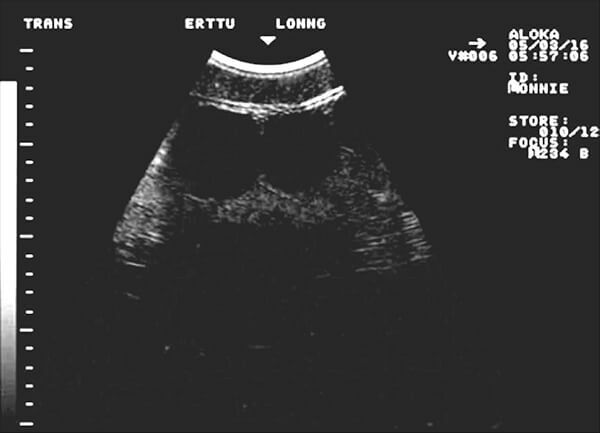 Ultrasound Examination and Behaviour Scoring of Captive Broadnose Sevengill Sharks, Notorynchus cepedianus (Peron, 1807), Zoo Biology 26:113.